Successful marketing strategies are a vital aspect of any business. This textbook provides students and potential managers in the creative industries with a solid grounding in how to maximize the impact of their marketing efforts across a range of business types in the creative and cultural industries. With a range of learning exercises and real-life examples, this text shows how to create and execute successful marketing plans for creative businesses and is useful for marketing students and practitioners. 'Dr. Kolb has lead the development of educational tools to support the cultural and creative industries. This book is essential reading for the classroom, as well as for incubators and entrepreneurs. It puts marketing strategy at the center stage of any successful venture in the CCI and provides a precise roadmap to achieve it.' - Javier Hernández-Acosta, Professor, Universidad del Sagrado Corazón and Consultant for cultural and creative industries, Puerto Rico. Creative and cultural industries account for a significant share of the global economy and working in these sectors is proving increasingly popular for graduates across a wide array of educational institutions. Business and Management skills are a vital part of the future of these sectors, and there are a growing number of degree schemes reflecting this. 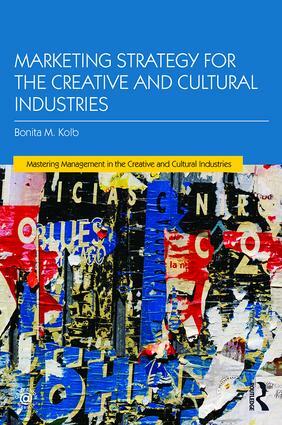 This series provides a range of relatively short textbooks covering all the key business and management themes of interest within the creative and cultural industries. With consistent production quality, pedagogical features and writing style, each book provides essential reading for a core unit of any arts / cultural management or creative industries degree and the series as a whole provides a comprehensive resource for those studying in this field.